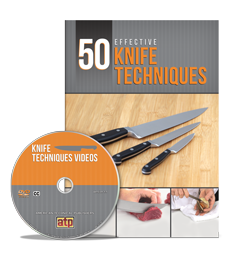 The 50 Effective Knife Techniques textbook explains and demonstrates the foundational knife skills necessary to create successful dishes. All 50 knife techniques include step-by-step instructions to reinforce proper cutting techniques for foods ranging from fruits and vegetables to poultry, seafood, and meats. Each instructional step is enhanced with a corresponding image to clearly depict the technique being described. This exceptional book also includes the opportunity to view videos for each technique where a professional chef demonstrates safe and accurate cuts that minimize waste, promote even cooking, and enhance presentations. The Knife Techniques Videos DVD reinforces each knife technique with a high-quality video that showcases the cuts being used in finished dishes, provides step-by-step audio narratives, and allows the user to pause or replay each step as often as needed while refining their knife skills.